Fish… To buy, or not to buy? That is the question. Don Seller, Purchasing Director and I attended the Sustainable Fish Forum at Fishmongers Hall last week to discuss sustainable fishing methods and the nuances of sourcing farmed fish (aka aquaculture). We also met with like-minded caterers to discuss the impact of wild fish capture and aquaculture within the catering industry, practical engagement initiatives for clients, customers and team members and have also pledged to support the ‘No to Bluefin Tuna’ fish campaign: it was a busy day! How can bartlett mitchell use more sustainable fish? 1. 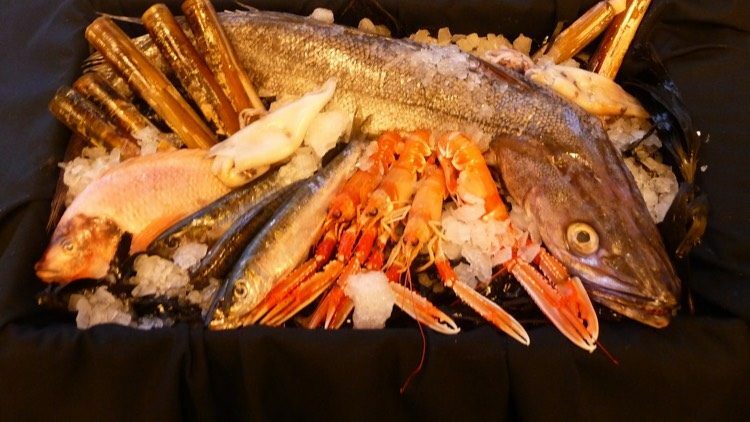 We need to continue to influence demand for the Top 5 Fish (Cod, Haddock, Tuna, Salmon and Prawns) by buying fish caught or farmed in a sustainable way from recognised or accredited sources. An important comment came from a round table of restaurateurs: stating that our fish comes fresh from Billingsgate is not the right answer. The devil is in the detail! 2. There’s a new accreditation that sits alongside Marine Stewardship Council (MSC) certified fish – it’s the Aquaculture Stewardship Council certification recognising sustainable fish farms. Tilapia and Pangasius farms became accredited in the first wave of certifications and they’re hoping to certify a number of salmon farms in 2013. Aquaculture, or intensive fish farming, has had negative press over the years – this certification seeks to enlighten fish farms and make positive changes to core standards. If you see a turquoise version of the MSC’s dark blue logo, that’s them! Fishing method (in this case hand-line caught). 4. ASC-certified tilapia with chilli salsa is rather delicious – thank you Regal Springs, the Fishmongers Hall catering team & Sustainable Fish City. Recommendations are for chefs to consider replacing it with sustainable alternatives like sardines, pilchards or herring. Line-caught inshore MSC-certified mackerel can still be offered on menus. How will our chefs know what to buy? By referencing MCS resource fishonline.org, which hosts the buyer’s guide to sustainable seafood, as well as keeping the ‘Pocket Good Fish Guide’ to hand. Recommendations are for chefs to consider replacing it with sustainable alternatives like sardines, pilchards or herring. Line caught, inshore MSC-certified mackerel can still be offered on menus. How will our chefs know what to buy? By referencing MCS resource fishonline.org, which hosts the buyer’s guide to sustainable seafood, as well as keeping the Pocket Good Fish Guide to hand. The BBC also have a topical fish quiz, click here for “7 Questions on Sustainable Fish” – what’s your score? In response to this enlightening forum we’ve contacted our fish suppliers to reaffirm our sourcing commitments and are planning a 2013 ‘Sustainable Fish Campaign’ to build on our ‘Fish Source’ menu feature. In fact, we’ll post a blog about it to share our progress!